An open Internet is essential to the American economy, and increasingly to our very way of life. By lowering the cost of launching a new idea, igniting new political movements, and bringing communities closer together, it has been one of the most significant democratizing influences the world has ever known. Which Country Might End Up Censoring The Internet? No, it is the United States. The Stop Online Piracy Act (SOPA) is a tyrannical bill that would severely limit what’s possible on the internet. Today, many websites have blacked out for the first time ever as a protest to oppose the bill. Email and tweet at your friends, tell them to tell everyone about the strike. 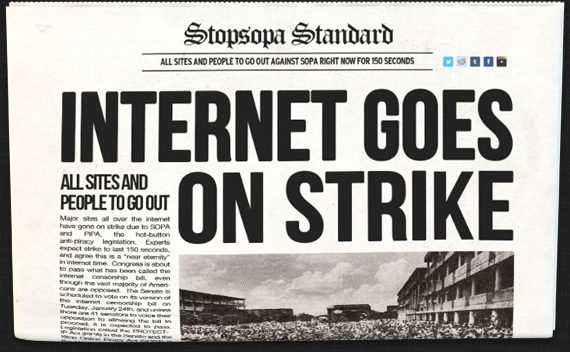 When the day comes, , tweet like crazy (#SOPASTRIKE), and call Congress. A special website has been created to connect you with your Senator.